A6 water colour style "Thank You" cards. To watch the tutorial on how to achieve this beautiful water colour style background please click the image below. Today we're doing something a little bit different and making some A6 "Thank You" cards using Neocolor II water-soluble wax pastels. 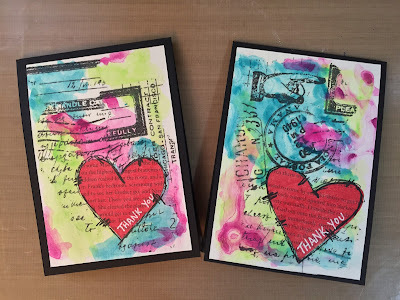 These cards are a nice colourful artsy style and are also very quick and easy to create. 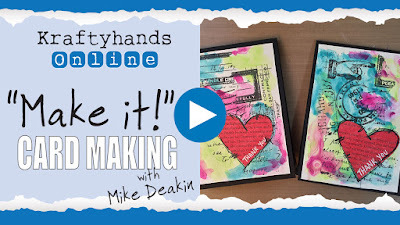 Perfect to make and keep on hand for whenever you need to send a thank you or a quick note of appreciation to someone. 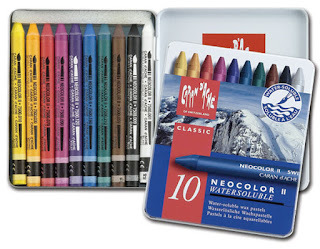 The Neocolor II water soluble wax pastels are available in sets of 10,15 and 30. For more information on the Neocolor II water-soluble wax pastels, click the image above. WOW love the video and I now need that tissue paper. where do I find it? It's Tim Holtz Tissue Wrap called Melange. I am trying to get it in the shop so watch this space!